They wake to the sound of “Reveille” and tuck-in to their tents after hearing “Taps.” They play and learn by day in clover-strewn grass and sleep in cozy tents under a blanket of stars set aglow by the light of the moon. They act out Academy-award winning parts in the Play Hall, canoe the great Greenbrier River, and paint like Picasso in the Arts & Crafts Lodge. And all the while they’re making new friends, trying their wings, and being guided by gregarious young counselors and gentle older counselors in a safe but adventurous and joyful camp environment like a century of girl campers before them. They are our Mini Campers — the youngest first-time campers who, as rising 2nd-5th graders, experience camp in a one-week mini session designed to introduce them to daily camp routines, group songs, traditions, a taste of independence, end-of-camp celebrations and more! 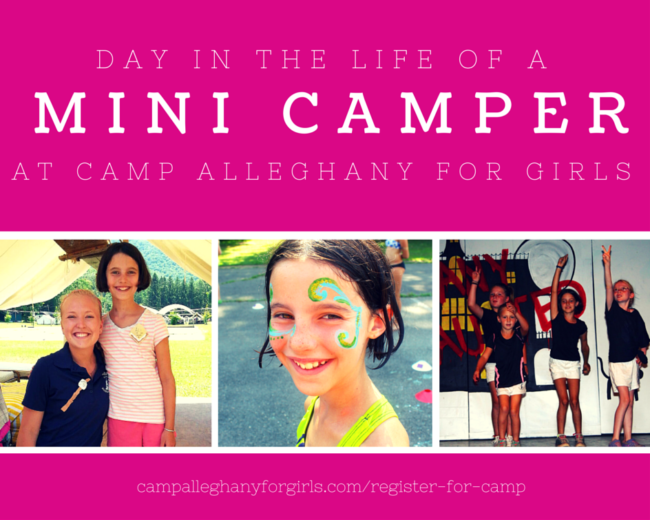 But what does a day look like for these Mini Campers? There is our schedule, of course, that explains it all in terms of time spent here or there doing this or that. But I thought you’d like to hear first-hand what a Mini Camper herself experienced at Camp Alleghany for Girls and the impression it made on her. So I set out to candidly interview Ali, about her first time at Camp Alleghany, when she came to Mini Camp at age 8, a rising 2nd grader. I hope you’ll also enjoy this photo gallery that captures typical elements of Ali’s days at camp. Elizabeth: What was your favorite thing about Mini Camp? Ali: My favorite thing about Mini Camp was the awesome friends that I made…and my counselor! Elizabeth: What things were new to you at Mini Camp? Ali: Some things that were new were doing the different activities I had never done before and they were awesome! I really liked canoeing and swimming in the river. Elizabeth: What things were hard for you at Mini Camp? Ali: What I thought was really hard was going back to the tent after a long day of fun. I just wanted to keep playing, I didn’t want to go to bed! Elizabeth: Were you ready to come home after Mini Camp or did you want to stay longer? Ali: Well, when it was time to go I really didn’t want to say good-bye to my friends. They were like family! I wanted to stay so much longer! But I knew I could always come back for Term Camp. Elizabeth: After Mini Camp what were you most looking forward to about Term Camp? Ali: I was really excited to see all my old friends again and catch up. Also, swimming in the river, doing the after-dinner activities, and having lunch under the apple tree. Elizabeth: Who was your tent counselor and what did you do with her? 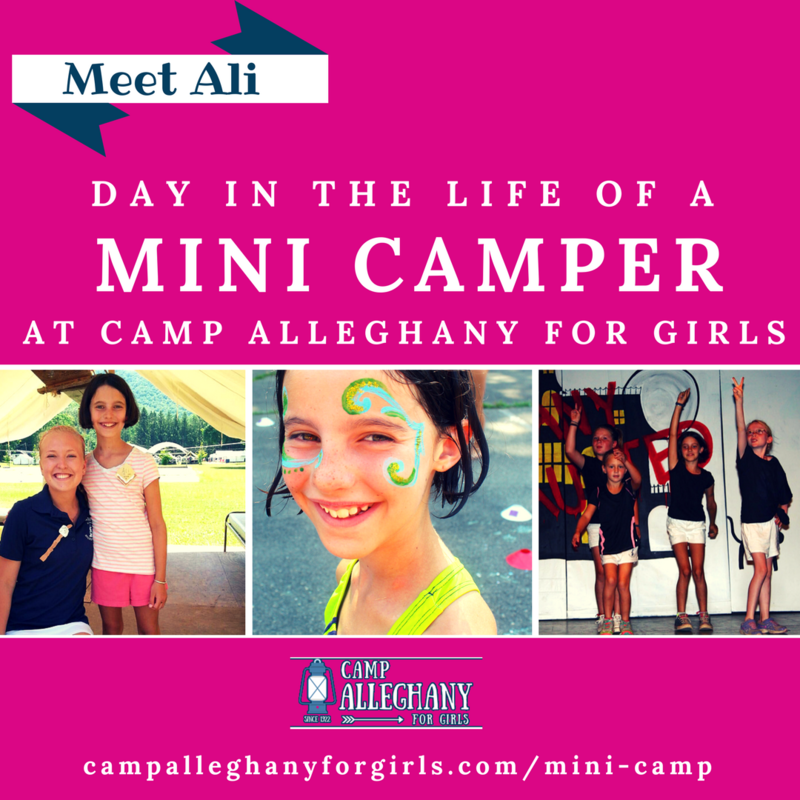 Ali: My tent counselor for Mini Camp was Emily. She was so nice. I remember that she would bring these huge coloring sheets for us to do. The pictures turned out awesome! We hung them all over the tent. When I went to Term Camp, my counselor was Camilla. She was also really nice. It was especially fun when she took our tent group to go float in the river at the end of camp. Elizabeth: What was it like sleeping in a tent? What was it like having tent mates? Ali: It was great sleeping in a tent. I liked that it was cooler at night. You could hear the river right behind you. It was nice how you could customize your space however you wanted it. My tent mates were all really nice. All your tent mates end up becoming your best friends! It’s fun keeping in touch through letters after camp. Elizabeth: What activities did you take? What did you think of your activity counselors? Ali: The activities I took were Riflery, Archery, Canoeing, and Dance. They were all so fun, but I REALLY like Riflery because when you reel in your target, and you got a really good score, it makes you feel great. All of my counselors teaching them were amazing. They were so nice! Elizabeth: What was your favorite thing about camp? Ali: My favorite thing about camp was all the great friends I made and all the new activities I took. Everything was awesome! Elizabeth: Do you think about camp now? What do you remember? Ali: I remember camp from all the great friends I made and all the songs we learned. The food was also really good. I started eating sausage at camp, and now when I have it at home it reminds me of Alleghany. I count down the days until I get to go again! Camp was the best week ever! There you have it, a Mini Camper in her own words with a ringing endorsement of life at camp! We look forward to welcoming Ali back to camp in Unit 2 this summer, her third year at camp, and her second time as a Term Camper. A resource I think you’ll like is our podcast with Mini Camp Director Beth Anne (BA) Clark Thomas. In it we address questions and concerns parents have about sending their camper(s) away to camp for the first time. If you have any questions about Mini Camp, please feel free to e-mail me or call: 540.490.0128 I’m happy to answer any question — no matter how simple or oddball you may think it is; all of your questions are important to me! 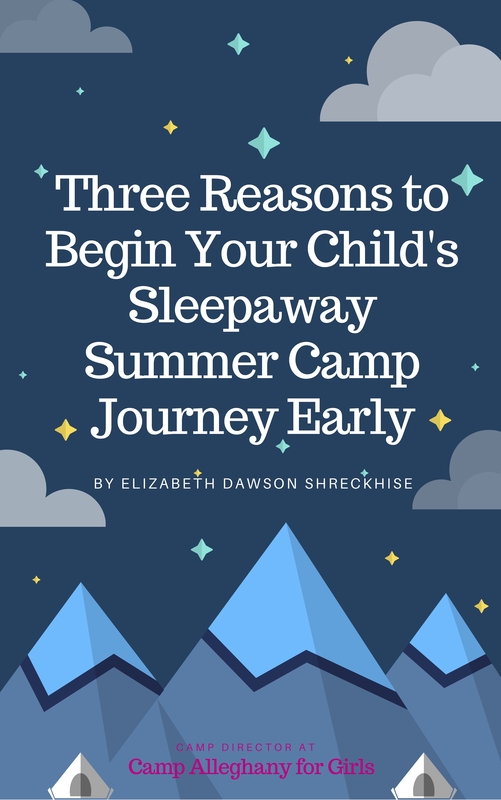 And, to learn more about the benefits of Mini Camp, please, download my FREE e-book, 3 Reasons to Begin Your Child’s Sleepaway Summer Camp Journey Early.